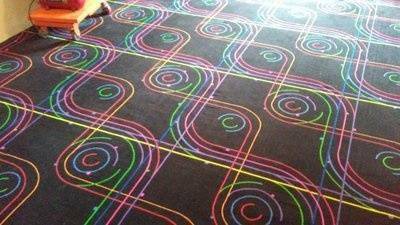 I’m finishing my basement and looking for arcade carpet (the carpet with stars, or any design really) and I’ve been to three flooring stores in my area and they don’t really deal with it but are trying to locate a manufacturer for me. Does anyone know the manufacturer or anything so I can go in there and be like hey carpet store call up this place. Thanks for any help anyone might have. Picked up mine from https://astrocarpetmills.com/. Lots of patterns and you can customize the colors, both sedate and IR reactive. I went Pizzazz in my main game room area. Now I am doing the garage and I am going Starz. I have them make the carpet into area rugs because we converted a house into a game room space and want to be able to turn it back easily if I have to. 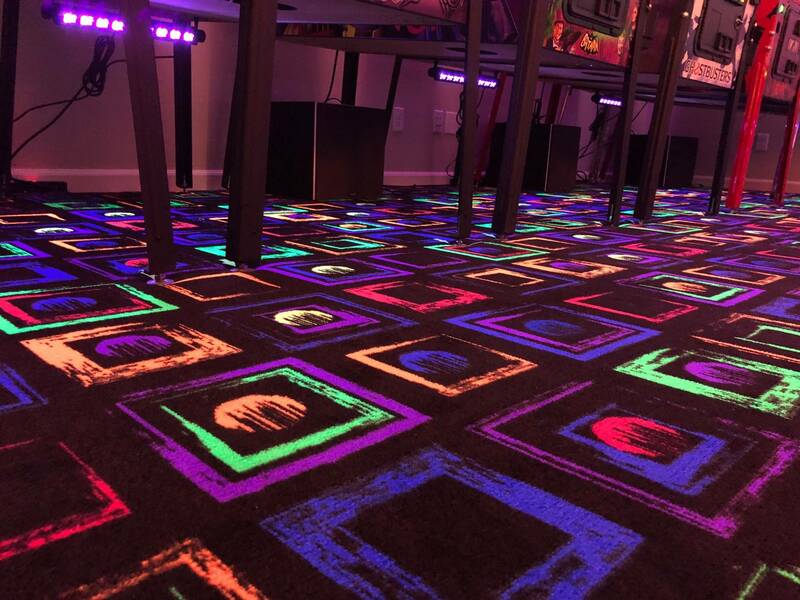 The carpet is pretty dang inexpensive compared to some of the other costs for a gameroom. I got two area rugs 11X21 and 3.5X6 for like $1,400. I did starz for my whole basement. Times Square, default colors. Lit with amazon.com link » mounted under every other pinball machine. Worth noting, I have two rows of machines facing each other. Otherwise I might need to rethink the lighting to get adequate coverage in the aisle. Guys thanks for all your help. I’ll look into those websites. I just got another call back from another floor store telling me too bad so sad. I did my basement in blacklight carpet from there about 8 years ago. I had a local carpet installer actually do the order so it saved me on shipping. The amount I had covered was about 900 sq.ft. My total cost shipped/installed (with a very thin underlayment) by the local shop was right around $1800. They did an amazing job lining up the pattern, not only with the layout of the basement, but with the layout of the pattern when joining seams too. Anyone ever get one done custom with a bumper cap design? or other pinball related design? Was it crazy expensive more for custom?